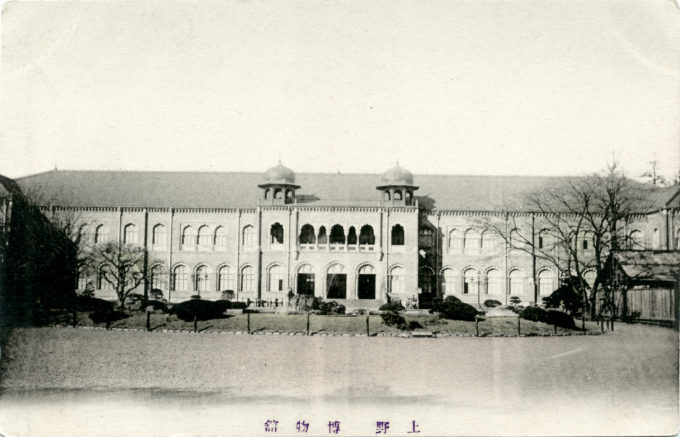 Hakubutsu-kan (National Museum), Ueno Park, Tokyo, c. 1910. Hakubutsukan (National Museum), c. 1910, as originally designed by Josiah Conder. The Hakubutsu-kan, built in 1877 at Ueno Park for the first Meiji Industrial Exposition. Designed by English architect Josiah Conder, the Hakobutsu-kan was Japan’s first museum and was championed by Hachida Hisanari, the Director of Museums in the Ministry of Culture, who spent considerable personal wealth to collect and preserve traditional Japanese art and artworks. This original buildng was destroyed in the 1923 earthquake.